Eden Brent sashayed her way into our hearts out here in Arizona with her amazing performance at Back Porch in the Pines two years ago. People were literally walking out from backstage to see what all the commotion was about and stayed to hear her sing. With the release of her new record, Mississippi Number One, on Yellow Dog Records, the rest of the world can finally see for themselves what the fuss was all about. Her new record features some wonderfully clever lyrics, three songs written by her mother Carole and liner notes written by renowned author and family friend, Julia Reed. It’s a brilliant record and one that should garner "Little Boogaloo" a Blues Music Award nomination for newcomer of the year. ”Darkness on the Delta” is a traditional blues that gives us the first opportunity to listen to just Eden and her piano. “When it's Darkness on the Delta…let me linger in the shelter of the night…Lord, I’m lucky…that you found me…where the muddy Mississippi waters flow.” The river is home to folks in the Delta and Eden conveys that in her interpretation of “Darkness on the Delta.” Eden’s piano and the soothing alto sax of Kevin Lewis introduce us to the next song by Carole Brent, “Love Me ‘Til Dawn.” “It’s the night time and the right time…for the kissing we’ve been missing…so enfold me, Honey, hold me…and love me, love me ‘til dawn”. “Love Me ‘Til Dawn” is a beautiful song and definitely one of my favorites on the record. We hear the wit and sass of Eden on the next song, “Fried Chicken,” written by Greenville’s own Jimmy Phillips. Rick Chancey’s picking and harmonica work provide the perfect companion to Eden’s vocals as we hear the virtues of fried chicken. “Fried chicken... wing takes a breast…leg takes a thigh…rice and gravy…black eyed peas and corn bread on the side…it’s a Southern institution…black skillet is preferred…fried chicken…a most delightful bird!” Delightful indeed! The energy of “Fried Chicken” continues with the title track, “Mississippi Number One,” paying homage to the other great highway in the Delta. Eden’s childhood home sits along side “Number One” and this highway is one of Eden’s favorites to travel within Mississippi. “Mississippi Number 1…carry me to my home…where the Delta Blues was born…along miles and miles of sandy loam…I’m Greenville bound… past the Indian Mounds…on Mississippi Number 1!” Definitely a highway we all need to travel one time in our lives. Next we find Eden alone with her piano interpreting two classics, George Gershwin’s “The Man I Love” and a traditional preserved by W.C. Handy, “Careless Love.” Both are very well done, but I find myself more drawn to her version of “Careless Love.” It’s just my preference, I guess. Jim Spake’s baritone and tenor saxophone work provide a gritty back drop for another original by Eden, “Meet You Anywhere”. “Meet You Anywhere” is a perfect example of classic songwriting by Eden. It’s an ode to a lover who has captured her attention to the point he’s the only thing on her mind and she would go anywhere to capture that passion again. “The distance between us…is more than a body can bear…I can’t wait to meet you anywhere!” Wherever they do meet you can be assured that sparks will be flying. Eden’s inclusion of the classic Joe McCoy song, “Why Don’t You do Right,” is indicative of her knowledge of classical blues and jazz standards from the turn of the century to now. I’ve had conversations with her concerning classic blues songs and she’s always amazed me with her knowledge. The definitive version of this song is attributed to Peggy Lee, but Eden’s version is captivating in its bare bones approach to the obvious self-inflicted poverty of the man she’s in love with. “Get out of here and get me some money, too!” Eden sings this song with just the right degree of detachment that lets you know she’s totally aware of the character of the man she’s in love with. “All Over Me” finds Eden reflecting on a good man and true love in her life, a love that moves her like no other has. “Even if I knew we could never be free…you’ll always be the best thing…that has happened to me…all over me.” Julia Reed notes that, “'All over Me' is so straightforwardly beautiful it brings tears to the eyes.” Eden writes straight from her heart and at times her lyrics can be as gut-wrenchingly painful as they are joyously happy. It’s the only way she knows how to write. The inclusion of Richard M Jones’ “Trouble in Mind” is another astute musical choice by Eden. “Trouble in mind…yes, I’ve been blue…won’t be blue always…sun’s going to shine in my backdoor…someday!” The final song on Mississippi Number One is the gospel-influenced, “Until I Die.” There were many nights driving back home to Greenville where Eden listened to gospel radio, to songs such as “The Blessings of Abraham” by the Tri-City singers. With a choir consisting of Van Duren, Darrell Bonner, Daunielle “Pie” Hill, Joyce Cobb, Jackie Johnson and Reba Russell, Eden pays tribute to the gospel music she loves and listens to quite often. “Suddenly in the night…your love took me by surprise…and I know, yes I know…I will be with you…until the day that I die!” “Until I Die” brings to a close a record that has been a delight to listen to from beginning to end. Unfortunately for me, I’ve only known Eden after her mentor and friend, Abie “Boogaloo” Ames, passed on so I don’t have a great feel for what that period of her life was like other than video I’ve seen of them performing together. 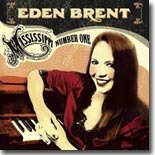 My sense is that Mississippi Number One is a coming out record for her on so many fronts --- it firmly establishes her as a performer in her own right, it shows great respect and honor for the writing talents of her mother, Carole Brent, and it shows Eden’s maturation as a songwriter since the release of her first record, Something Cool. Several years ago, I stumbled onto a documentary on PBS called Sustaining The Sound. It told of the unlikely friendship between an old bluesman, Abie “Boogaloo” Ames, and a young lady from Greenville, MS named Eden Brent. It was an amazing thing to watch because the rapport between the two was incredible. Coming from two totally opposite worlds (Ames was a 70-something black man inclined to wandering from place to place, often drunk and undependable, while Brent was a young white woman who came from a privileged background and studied jazz formally at the University of North Texas), the two just appeared to have an inseperable bond as musicians and as friends. It was a relationship that paid dividends for both parties….Brent was able to learn the blues from a master and Ames was completely reinvigorated and was fairly active performing until shortly before his death in 2002. Even more amazing was watching Eden Brent perform. Though still a work in progress at the time, not only was she an accomplished pianist in jazz and blues, her voice sounded like the voice of someone mature beyond her years: deep, husky, and smoky. That was nearly ten years ago and she sounds even better now, as proved by her latest release, Mississippi Number One (Yellow Dog Records). Songs like “He’ll Do The Same Thing To You,” and “Meet You Anywhere,” which feature Brent with a full band including a horn section, definitely have soulful roots in the Bluff City, while her delivery of close friend and fellow Greenvillian Jimmy Phillips’ “Fried Chicken” should make any southerner worth his salt start thinking about supper time. The dynamic title track (named for the state highway that runs basically parallel to the Mississippi River from around Onward to just north of Friar’s Point) could be defined as the perfect driving song, even with $3 a gallon gas. She also does an atmospheric reading of “Darkness On The Delta,” a track that “Boogaloo” Ames played on for Cassandra Wilson’s Belly of the Sun disc shortly before his death. Best of all are the songs featuring Brent accompanied only by her piano. Mississippi Number One was originally intended to be a solo record and these songs show that there wouldn’t have been any problem if that was how it had ended up. Most of these songs are Brent’s fresh interpretations of songs by the Gershwins (“The Man I Love”), W. C. Handy (“Careless Love”), and Kansas Joe McCoy via Peggy Lee (“Why Don’t You Do Right”). If you haven’t heard of Eden Brent, that should be changing soon if there’s any justice in the world. Mississippi Number One is a delicious slice of blues, soul, boogie, and jazz that should be in any discerning music fan’s collection.